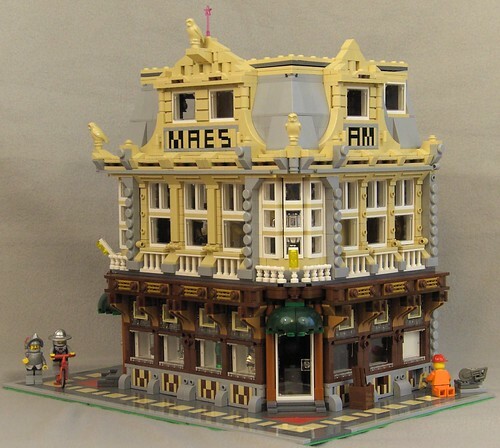 Brick Town Talk: Mending a Masterpiece - LEGO Town, Architecture, Building Tips, Inspiration Ideas, and more! Belgium - (BTT) While nothing lasts forever, some things try their darnedest to prove that statement wrong. Thankfully, great architecture is often one such thing. Currently undergoing some minor repairs to the extraordinary ground floor facade (and honestly, who doesn't need a little lift and tuck after a few centuries?) MaesHouse stands just a proud as the day it first opened. Beyond the wood trimmed windows and carved stone detailing lies a very eclectic interior - from an ancient Egyption sarcophagus to a bright and cheery studio apartment, this is one building that continues to surprise both inside and out.